CATE 2012 Application Form can be purchased and submitted to these colleges. 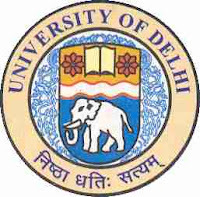 DU CATE 2012 Eligibility Criteria- Minimum qualification is pass in 10+2 examination. For more details obtain DU CATE Appplication Brochure from the desiganted colleges or Click Here to read Online. The Price of DU CATE 2012 Application material is Rs 350/-. CATE is designed to test a candidate's aptitude for BA (H) English. The question paper will consist of two parts. Part A will comprise of multiple choice questions (MCQs) and Part B will comprise of descriptive type questions (comprehension and essay/creative writing). Candidates will have to attempt both parts of the question paper in the same sitting. In any case, it must be noted that only those candidates who qualify in Part A will have their Part B scripts evaluated. The final aptitude quotient which is known as the CATE score, will be determined by collating the class 12th Examination marks(best of four subjects) and the CATE marks on a ratio of 30:70. A merit list is then compiled on the beasis of the collation The participating colleges will admit candidates to the course on the basis of cut-off points declared by them after the CATE scores are announced. Students appearing for CATE 2012 Examination are invited to send us CATE question papers. Entries will be published on first come first basis along with your short bio.